I'd first seen details of steel target shooting at long ranges in one of the shooting magazines and decided it was a challenge I was up for. Having spent many happy hours shooting paper at the National Shooting Centre Bisley I wanted something that reacted when I hit it. Showing the article to mates from my rifle club I found I wasn't alone. So we made a booking for July hoping for decent weather and I made sure I had ballistic tables for my various rifles printed out and tested. 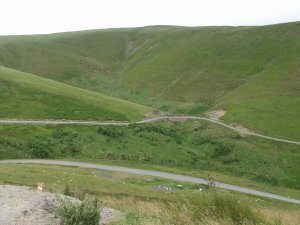 The facility is in Llangurig, South Wales about 4.5 hours drive from home. We met up with everyone at the Blue Bell Inn for supper, drinks and to meet Andrew Venables who runs Wildlife Management Services (WMS). We discussed our experience, calibres to be used and what we wanted from the day. Andrew is able to tailor the day so everyone in the group gets the most out of the time spent on the range. After a pleasant nights sleep in a local B&B we met up with our fellow club mates together with Andrew and drove to the shooting facility. 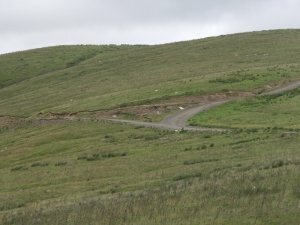 The facility is about 5000 acres with 20 miles of internal roads and tracks. The roads to the 'office' are fine for any vehicle, but some of the firing points will need a 4x4 or you can take the healthy option and walk. 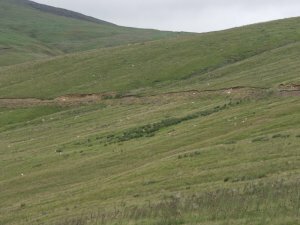 As you drive through the hills full of sheep you start to notice targets of various shapes and sizes placed along the way. 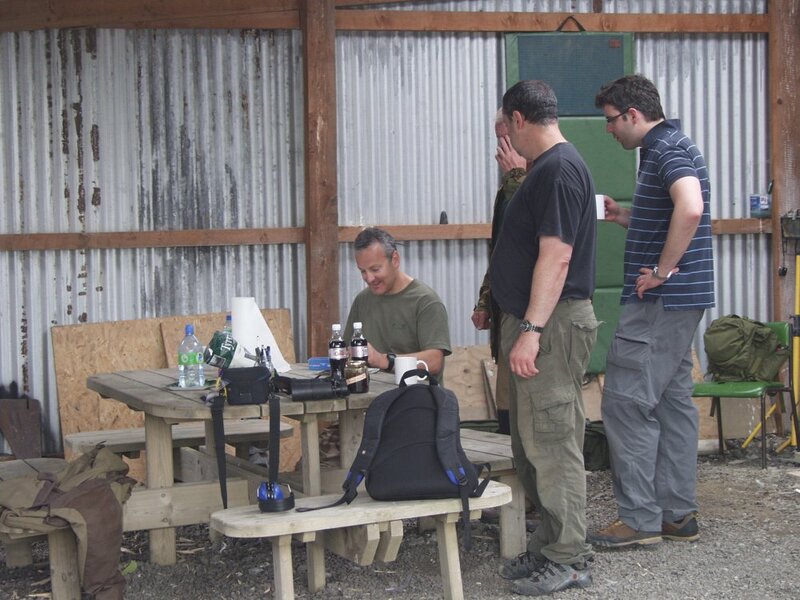 Base camp is a large clearing with several farm buildings and the WMS office complete with tea and coffee making facilities. It was here we unpacked and after filling in the paperwork Andrew gave us the comprehensive safety briefing. 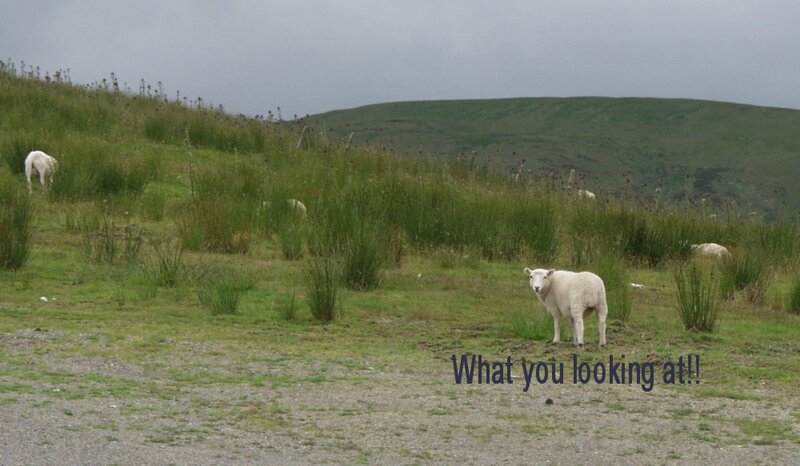 This included what would happen if we shot one of the many sheep running around! These seem totally used to the firing and show no reaction when shots ring out, they just look at you like they've seen better! 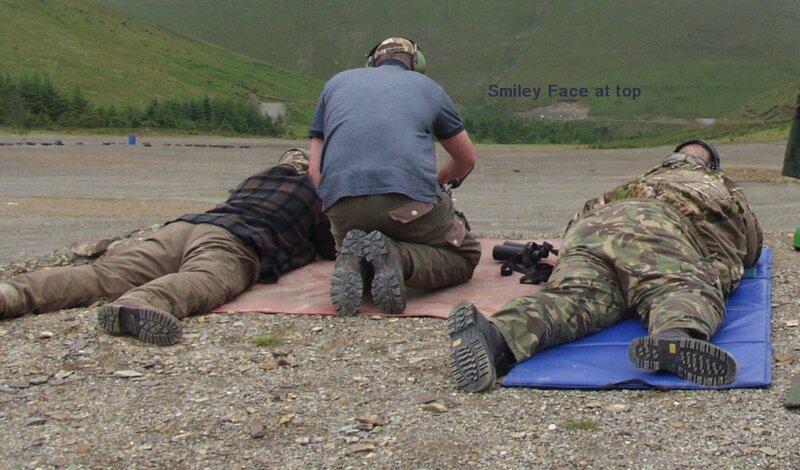 We were then given the chance to zero our rifles on targets at 100 yards and once happy we were given our first group challenge to shoot some falling plates at 130 and 170 yards from a sitting or kneeling position. We all lined up and then took turns till they were all down, with I'm pleased to report no one failing to hit at least one of the plates. The plates were then reset and those brave enough shot at them standing unsupported and again the plates quickly started to fall. (Note, clicking on the images will show a larger version indicating where the targets are). After one of many tea breaks we walked a few yards up the hill and could see on a far ridge line a number of targets places at 300 yards. These consisted of a figure 11 target (head and torso), rabbit and crow cut outs plus a fox to the left. Safety always being a priority we were told about a public footpath and to alert everyone if any walkers were seen. Andrew ran through the drill, which consisted of ensuring someone is spotting for your BEFORE taking the shot, so if you missed they can hopefully tell you where the shot went. This was essential as the wind was gusting around 10mph drifting our rounds about a foot to the right at 300 yards. If you watch the video you'll hear how windy it is and also hear various shouts of 'Spotting' before a shot is taken. I used my .223 rifle for this and decided to aim off as I know where on my reticle the 300 yard aim point it after practice at Bisley. 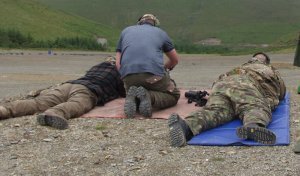 But aiming off for wind was another matter, as it wasn't as easy as expected keeping the rifle still whilst not aiming at the target. We all quickly got on the figure 11 target and split into two groups taking shots at the smaller vermin plates. Having a mate shouting out adjustments really helps, and we quickly got used to moving right two crows. 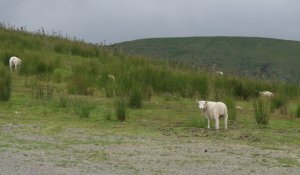 We also had our first sheep break as a couple of ewes sauntered across in front of the targets. This video shows us shooting the figure 11s, listen out for the delay between seeing the puff as the target is hit and the noise of the metal being struck. After clearing these small vermin targets we moved a bit left and shot at a life size fox target, aiming at the highlighted in red heart lung killzone. 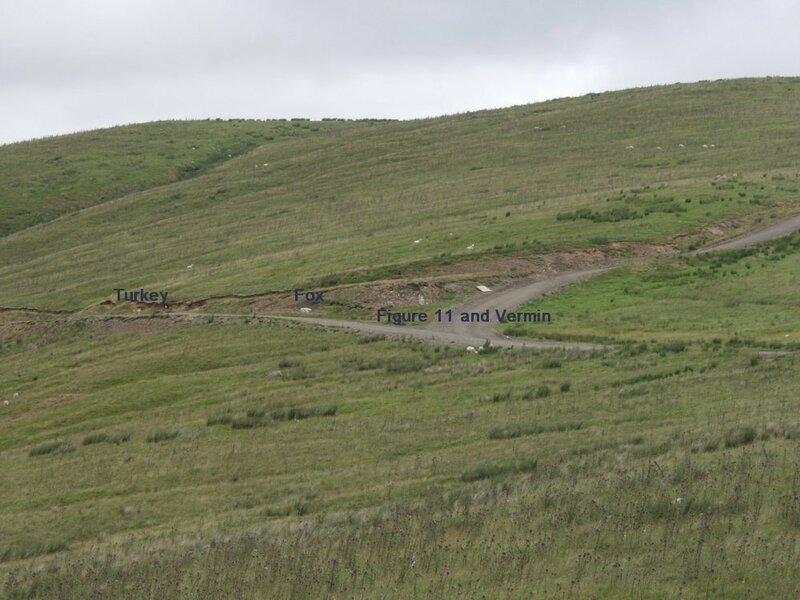 Down the track from the first group of targets are a large turkey and deer target at 400 and 500 yards together with yet more rabbits and crows. To the right at 200 yards were several small chicken shaped targets, so we split into two groups, those with lighter calibres like my .223 taking on the chickens! 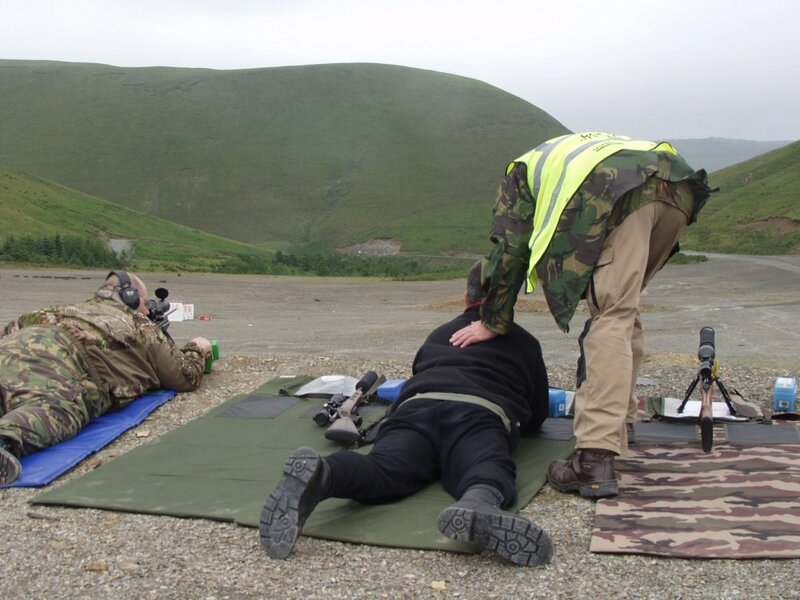 Having already had a huge variety of targets at several different ranges the weather was closing in (you could see the dark clouds coming towards us) and Andrew decided it was time for lunch. Lunch is a self catering affair. We picked up some rolls and filling from the shop opposite the Blue Bell Inn along with probably the best pickle the world has known. One of our group still talks fondly about the pickle more than the shooting! There is plenty of room to relax and eat your lunch under cover whilst chewing over your greatest shots taken that morning. We also took the opportunity during the break to quiz Andrew about how he got started and the kinds of people he trains. It seems only a small part of his time is spent with civilian groups like us. It was interesting to hear about some of the rifles that have been shot and the development of his targets to ensure they survive hits from even the mighty 50 cal. The steel is heat treated and plasma cut under water. He doesn't like putting in extra holes as it tends to eat drill bits. After lunch we then turned 180 degrees and shot through the valley to targets around 600 yards away. Some of us moved up a calibre, I switched to the .243, calculated the drop and adjusted our scopes around 15 minutes. Targets at this distance consisted mainly of figure 11s, some with hostage add-ons. These have an extra head to one side that swings behind when hit, the idea being to hit this head without hitting the hostage. 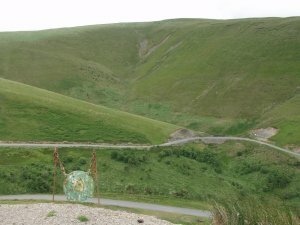 New targets introduced were gongs on chains (some complete with smiley faces) and a large mountain sheep. The 10mph wind was pushing the .243 round almost 4 feet to the left at this range. Instead of aiming off I adjusted my scope and then aimed slightly left or right depending on how it was gusting. It was difficult as a spotter to see where any misses went, but we all managed to get on target quickly and either take out the hostage taker or swing the gong. This video shows some the the gongs being hit at 600 yards. Notice the extra time delay before you hear the noise of the strike. It was then back to 800 yards. I decided to stick with the .243 and go up another 12 minutes, but the little 70 grain bullet didn't handle the wind well and I didn't get many hits. With hindsight I should of gone for the .308 (as I did for the finale later). Hitting the targets, especially the gongs, at this distance means it takes almost two seconds to hear the reassuring noise of a hit normally followed by a cheer, even if it was sometimes an internal one. Andrew was always on hand watching for any problems and offering advice. Sometimes all that was need was a bit of encouragement and suggestions as to what the problem might be and how to get back on target. 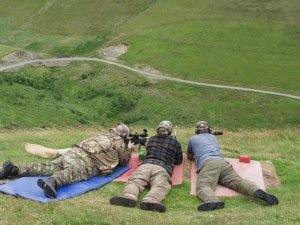 As the weather was closing in we agreed not to move back any further (you can shoot targets at over a mile) and instead move to a location so we could practice shooting down hill. Piling into the 4x4s we drove further into the facility up the hill that overlooked the valley we were in. Here there were two target areas. The first were 8” gongs at 300 yards with a pond behind (excellent to identify where misses are landing) and a couple of hostage targets. To the right of these were the same targets we had been shooting previously at 600 and 800 yards. 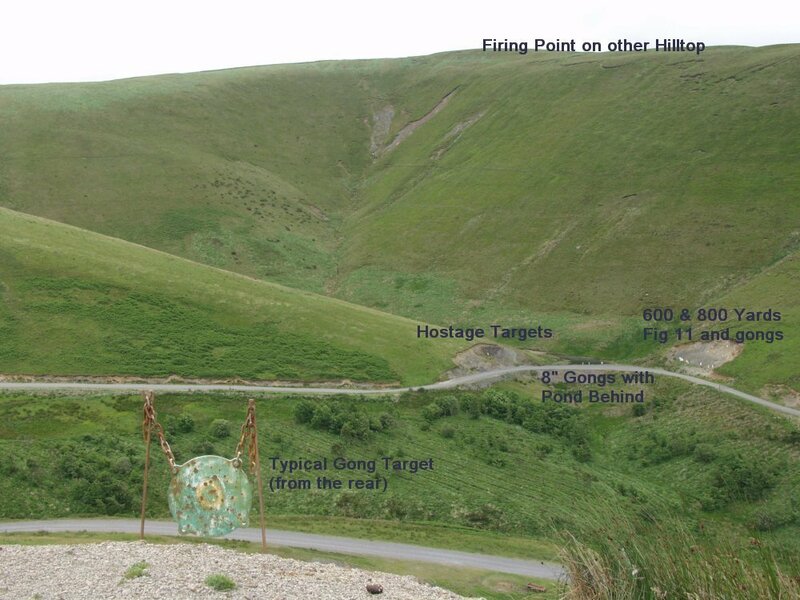 Just in front of the firing point you can see one of the gongs shot from the other side of the valley at some 1000 yards. 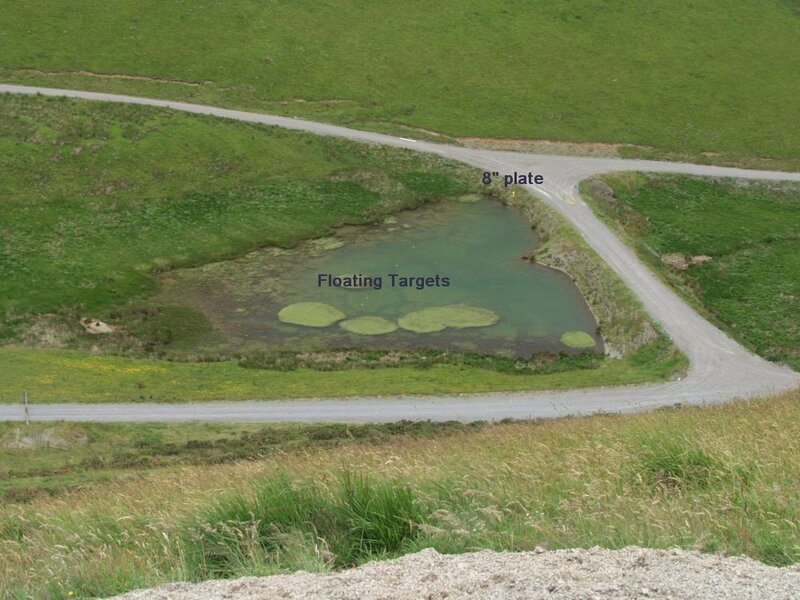 The second area we shot in the valley was a pond with floating targets and a few 8” plates around the edge. Although the range finder showed the distance to be 400 yards, a quick bit of maths worked out the horizontal distance was 300 yards so scopes where set for this distance. I went back to the .223 and aimed off as before. 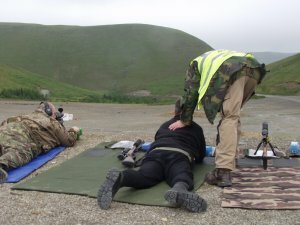 This video shows how it should be done, shooting down hill using your knee as a support. Very good shooting indeed. Sadly, it wasn't me in the video. One of the highlights of the day for me was to hit one of the hostage targets at 300 yards with my first shot. The training given by Andrew was finally sinking in. A mate clipped the ear of the hostage, but we decided a lost ear was worth it to hit the hostage taker! Even though it was the middle of July the light started to fade and the weather was closing in. 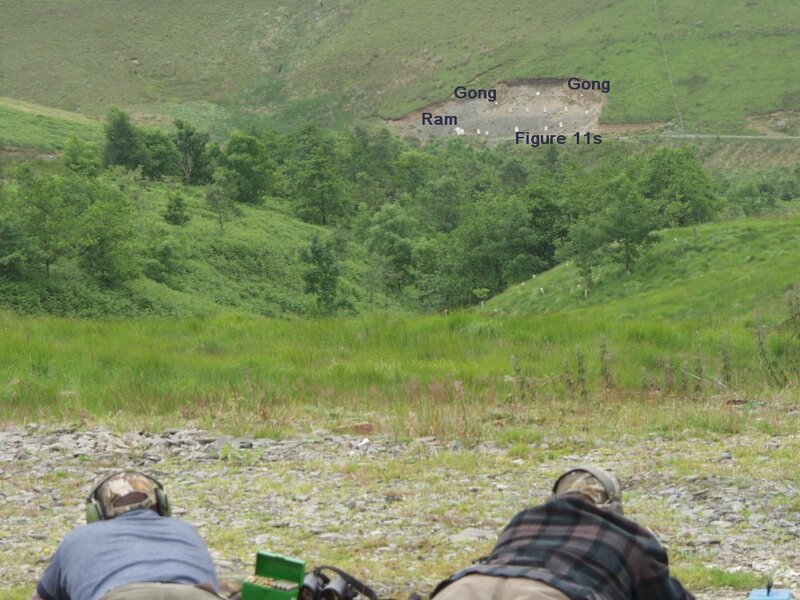 Andrew set us the final challenge of the main gong back on the 800 yard firing point. I broke out the .308 and adjusted my scope. We had a couple of minutes to get on target and work out what the wind was doing and then took turns to fire three shots at the smiley face gong at the top of the target array. The weather had taken a definite turn for the worst, and although we all managed to hit the target at least once, only one member hit it all three times. 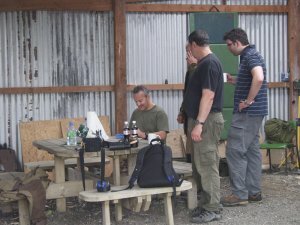 We trudged back to the office and had a last cup of tea, pack up the rifles, last bit of banter and then headed for home. An absolutely fantastic day and we'll be back next year. Take more ammo than you think you'll need. We all shot well over 100 rounds each. Work out the ballistics for each of your rifles and print out tables showing drop for various distances. Scopes with resettable target turrets and mildot reticle are an advantage.